If you knew how to win in court 80% of the time, choosing the lawyer and selecting the statute argument that would convince a judge to rule your way, what would that mean to your legal challenges? Toby Unwin, co-founder of Premonition.ai shares how he came up with this amazing strategy to disrupt and create an unfair advantage. Plus he reveals how he did three years of law school in one year with only 90 days of studying, his systems for accomplishing so much, the millionaire’s secrets to success, and solid advice for a happy life. 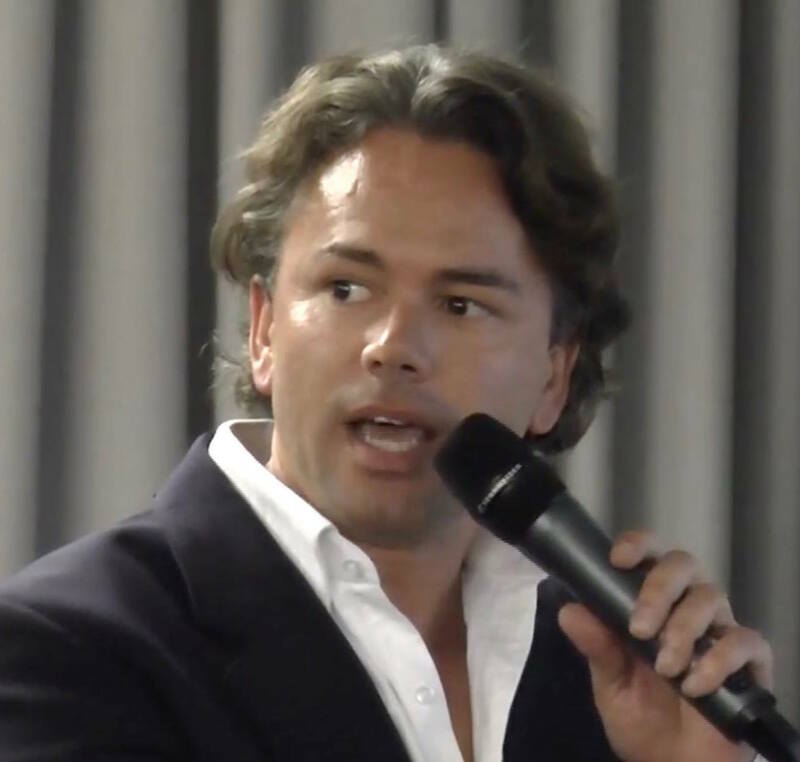 Mark S A Smith: My guest today on the Selling Disruption Show is co-founder of Premonition, Toby Unwin. This is the only company that uses big data analytics to analyze attorneys by win rate. He’s the inventor of the Premonition System, giving people an unfair advantage when they go to court. The whole idea here is information is power and disrupts everything it touches. Toby began his career in recruitment, eventually founding NetSearch. You might recognize that term. It was an online headhunting term. He sold it for a lot of money when he was young. He was inaugurated as the Republic of Austria’s Honorary Consul in Orlando, the youngest ever appointed. He serves as Chairman of the Municipal Guarantee Fund, a non-profit organization which has provided over three billion — that’s right, a “b” — in capital to financial institutions and won Fund of the Year. 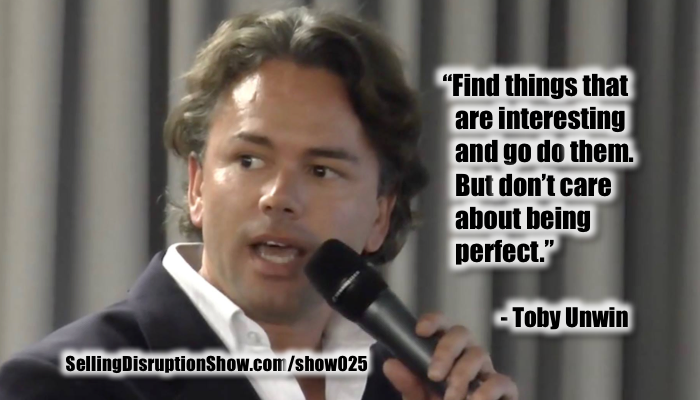 He’s the bestselling author of several books, 11 patents, and a video series teaching commercial property investment. As you can see, he is a disruptor. He speaks five languages and studied international commerce law at King’s College in London. Toby, I am so delighted to have you on the show. Welcome. Toby Unwin: Thank you. It’s great to be here. Mark S A Smith: I want to talk about Premonition. I learned about you when I discovered Premonition, how you are using artificial intelligence to figure out how to win cases in court. How did you get started in that? 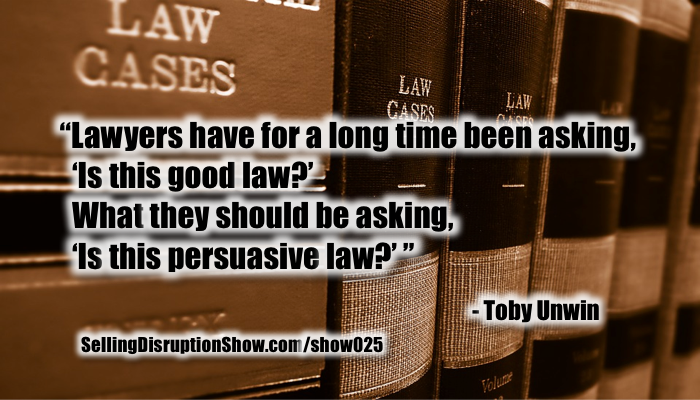 Toby Unwin: I got sued a lot and it really pissed me off. Mark S A Smith: Pissed of Toby makes things happen. Toby Unwin: Yeah. Pissed off Toby doesn’t yell, just gets very quiet and comes up with an idea. Mark S A Smith: Tell me about Premonition. Toby Unwin: Currently when people are choosing attorneys they pick them from billboards or recommendations from a friend or some of those “best lawyer” lists and things like that. Mark S A Smith: Fundamentally, people pick attorneys the same way they pick a restaurant. Toby Unwin: With a restaurant, you actually have decent reviews given by people that go to restaurants a lot and actually know what they’re talking about, whereas even when people review lawyers, if you look at lawyer reviews they’re usually written by another lawyer or they’re written by people that just have not hired many lawyers. I’ve hired, I don’t know, maybe 70 or 80 in my life for various things. Mark S A Smith: That’s a lot of experience with lawyers. Toby Unwin: Yeah. Even before I went to law school very late in life I’d read maybe 18 feet of law books, and I was struggling finding a good lawyer. Most people do. In fact, most lawyers struggle. If they have to find local counsel for a client, they really have very little idea of how to do it. They usually wind up asking other lawyers for recommendations and things like that. Mark S A Smith: Of course, they’re using gut-type of recommendations in this case versus data. Toby Unwin: Yeah. Actually, when you have the data and you look at these lists, often they’re not just random but we’ve actually found very strong negative correlations in many of these things. For example, we got to test the internal data of a lawyer recommendation service, and we found 37% negative correlation. Toby Unwin: The better service said, the worse the people did in court. Mark S A Smith: Wow. That’s not going to help out people very much at all. How did you approach this? How did you change this and disrupt this to make it a much better system? Mark S A Smith: I’m just shocked that this hasn’t been done before by somebody, like Lexus Nexus or some other organization that theoretically gathers huge amounts of data. You managed to snag it right. Toby Unwin: Yeah. It’s very, very hard the way those organizations currently get data. They do much of it manually. They’ll have someone sit in the courthouse and print it off and walk it to the other side of the courthouse and make a few notes and then scan it into their system. That’s how they do it, and they still do it to this day. Mark S A Smith: That sounds ripe for disruption. Toby Unwin: Oh, yeah. Problem is, you’ve got 41,000 lawsuits filed every day just in America. Toby Unwin: That’s nuts. You can’t scale a process like that. Mark S A Smith: No, you sure can’t. Toby Unwin: As a result of it, those big systems that you think know every case know tiny fractions of what actually goes on out there, and all of that data resides at a county level. You’ve got 3,124 separate courthouses, and they’re not connected. Sometimes they’ll connect within a state, but, for example, if you do something naughty in Miami, they have no idea about that in Orlando. Mark S A Smith: Interesting. That’s the reason why when you fill out applications people want to know where you’ve been, so they can check those jurisdictions. Toby Unwin: Exactly. They ask where you’ve been in the last five years because they have to because they don’t know. Mark S A Smith: There’s a lot of disruption opportunity here. Mark S A Smith: How did you proceed to make this happen? Mark S A Smith: Oh, interesting. Mark S A Smith: So fewer than 1% of the legal outcomes are even available online. Wow. Mark S A Smith: Sounds like a lot of friction. Toby Unwin: Yeah. It’s just really, really hard. But the crazy thing is, this data was all out there. It’s like an open secret. You could find this, but it just was really, really difficult. I have a data background, so I was like, “Okay, I just need to get hold of this data. Once I’ve got that, then I can crunch it, then I’ll know who the best people are.” It’s quite eye-opening when you start looking at the results of that. Mark S A Smith: What type of results did you determine based on that? Toby Unwin: There’s an old saying that a good lawyer knows the law, but a great one knows the judge. Toby Unwin: That’s not just true, it’s 30.7% positively correlated. In layman’s terms, that means that nearly a third of your outcome is down to which lawyer you choose before the judge. There’ll be some judges that are more impartial than that. We found practically every judge has a pet, someone that just flat out does not lose in front of them. Mark S A Smith: Interesting. Practically every judge has a pet lawyer. Toby Unwin: Yeah, and those usually have several and they’ll be in different categories. For eviction you want one guy. For contract law you want someone else. Some people are really good in one area, but if you take them out of their comfort zone and put them in a different court or a different judge or case type, they can suddenly be terrible. Mark S A Smith: Very interesting. The idea here is that Premonition can help people select the right attorney based on the judge that they will be facing that gives them a higher chance of a positive outcome. Toby Unwin: Yeah. If you’re a big company and you have a bunch of litigation that would be, say, 50/50, if you start using Premonition, well, now that goes to 80/20 in your favor. Mark S A Smith: That’s a massive disruption, both for people that need lawyers as well as for the legal system. I think it really points up some of the challenges that we face in the legal system as well, but until they’re fixed, we might as well have things in our favor. Toby Unwin: Exactly. 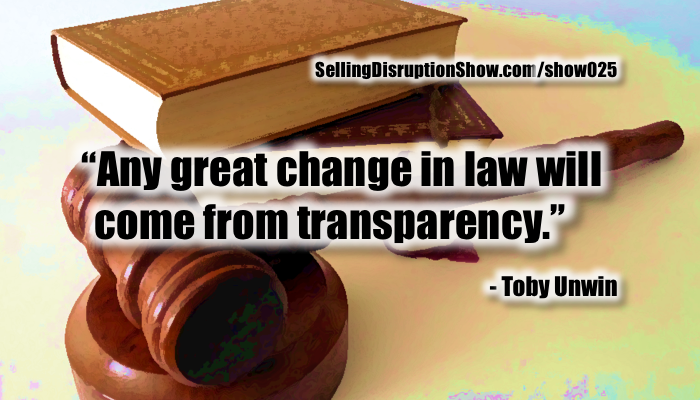 Every great change in law is going to come from transparency. Mark S A Smith: That’s a delightful observation: Every great change in law is going to come from transparency. You put together the database and the systems to help people make this determination. Now, is it operating outside of the Florida area as well? Toby Unwin: We’re actually the world’s largest litigation database now. We didn’t set out to do that at all. In fact, we really did no research into the market at all. We didn’t research who our competitors were. We didn’t research how much we’d have to do or how long it would take or what the challenges were. We just decided that we would do it, which is not a very professional way of approaching it, but that’s how we went about it. It turned out that that actually worked in our favor, because no one had put together something like this before because it was assumed to be impossible. Fortunately, I never spoke to any of those people, so I was unaware that it was impossible and therefore went and did it. Mark S A Smith: You’ve done a lot of impossible things. I want to change gears just a little bit. You have done some extraordinary things. You are a National Rowing Championship winner. You hold a world air speed record. You speak five languages. You’re an attorney. You’ve put together the world’s largest litigation database. 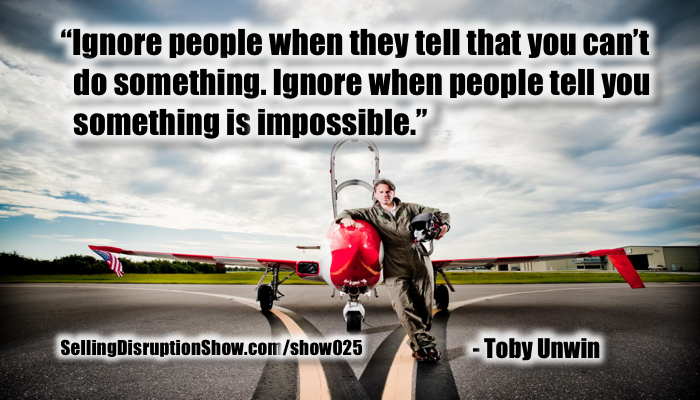 Okay, Toby, what is your system for doing all of these amazing things that people say can’t be done? How do you disrupt? Toby Unwin: Actually, I’m not an attorney. I went to law school, but I’m not an attorney. Mark S A Smith: That means you can be my friend, huh? Toby Unwin: Yeah. I can represent anyone in court in any jurisdiction as long as they’re Austrian and I don’t charge them. I specifically didn’t want to actually take the bar or anything like that. I thought it was better what I did that I didn’t do that. In terms of system, I guess I find things that are interesting that I think I can do, and I don’t care about them being perfect. Toby Unwin: I’m what they call the guy that graduates bottom from his class in medical school. Mark S A Smith: A doctor. Mark S A Smith: Yeah, what do you do? It sounds like you wipe out everything with that piece of advice. Toby Unwin: Well, you wipe out nearly everything. What I do is I get the study guide. That breaks each subject down into 250 pages. Then I would get it on Kindle, or, if there wasn’t a Kindle version available I would get the book and have it scanned into a PDF. Then I’d read it on my iPad, and as I’m reading it I’m highlighting the text. Then Kindle has this great export notes function. Usually in law when you’re studying it you write up your notes into what’s called an outline, all of your notes from every book you’ve read from all of the classes you’ve been in. People will spend five or six weeks typing this stuff up, whereas I’ve just exported my notes. I just need to spend two days making it look pretty, and, hey, presto, I have an outline. I’ve saved weeks right there just by going with the electronic version rather than going with the paper version. After that, usually people would have a 50- to 60-page outline. I’d have a 90-page, but 90 pages is too much to learn. I thought, “Okay, what’s the minimum to get this done?” First off, if it’s not talking about a statute or a case, then it’s just chitchat, so I can just delete that. Then you can take a statute book into the exam, so, okay, I don’t need to learn all these statutes, I just need to know where they are in the book. Toby Unwin: I just highlight that. Also, from a study guide they tell you which statutes they reference, so you don’t need to read the whole statute book either. You just go from the study guide and just highlight the ones that are in the study guide. The last bit is, even a study guide that’s got it really slimmed down, they’ll give you about five cases to illustrate each point in law. You don’t need five cases. You either need the leading case, or you need two what I term book-ending cases. If it’s close to this set of facts, it’s this decision based on this precedent, and if it’s closer to this other set of facts it’s this other one. You don’t need five. You’re needing one or two, and you can delete the rest. Typically, you’d learn a particular, Smith vs. Jones 1972. I had a huge amount of difficulty in trying to remember the dates of all this stuff. You know how you make a mental picture of what Smith vs. Jones might look like, and I’d put a different type of car in it for each year in my head. Then I read somewhere that you didn’t actually need to know the date or the court it was in. You just needed to know “Smith vs. Jones”. I was like, “Okay, that makes it a hell of a lot easier as well.” Then I’d just turn all that stuff into flash cards, memorize the flash cards. I could do a course which would normally take about three months, I could learn that in a week. I’d actually registered at five law schools at the same time, and I did three years’ worth of law school in a year with 90 days of study. Mark S A Smith: Wow. Fantastic. Thanks for breaking down your system. It’s brilliant. The whole idea is figure out exactly what needs to be done, ignore everything else, that minimum viable set of information that’s required, and then figure out what you need to know. You hacked the testing strategy. You chose five different law schools so that you could speed your way through the legal training where they would not allow you to do that in sequence. That’s brilliant. Toby Unwin: Actually, it’s not that brilliant, because it didn’t work. I passed it all, but in a normal university you can combine credits. None of these universities would take each other’s credits, even though top schools like University of London, King’s College, that kind thing. Mark S A Smith: Of course they don’t. They want to operate as a monopoly. Toby Unwin: Yeah. They said that law school is somehow magically sparkly and different. I had to wind up doing years two and three at Nottingham Trent, so basically I did law school twice. Mark S A Smith: The point is very clear, though, and that is you figured out a way to hack the system, and since you don’t want to practice, it’s not important, but you have all of the skills, you have the insights, you have the systems that put you well ahead of the rest of the legal system, hence Premonition. Mark S A Smith: A built-in lawyer joke. I love it. What type of things are you working on today that you see are as disruptive as Premonition? You’ve always got so much going on. Toby Unwin: … based on the precedents. This does the work of the judge. Mark S A Smith: That’s brilliant. You’re using AI, all the case law, and the insights that you’ve generated to identify whether a pleading or motion is going to be accepted or rejected. Toby Unwin: Yeah. I came to a realization that when people use these legal research tools, that they for centuries have been asking the wrong question. They ask, “Is this good law? Is this law that’s still valid?” Whereas they actually want to be asking, “Is this persuasive law? If I cite this case to my judge, what does he think about it?” I’ve got a joke that for every precedent there is an equal and opposite precedent. Toby Unwin: I want to know … For example, in the UK you’ve got two famous cases, Crown vs. Brown and Crown vs. Wilson, that have almost identical facts and completely opposite outcomes, and yet they’re still both good law. You can quote either one. Whereas if you came to me with a Crown vs Brown argument, I’m going to find a way to differentiate it and rule against you because I don’t like that case, you need to know that before you make the argument. Mark S A Smith: … if you’re going to use that argument. By bringing data into play, you know which way the judge is likely to lean. This pleading or motion is based on a particular judge that you have in mind. Mark S A Smith: Brilliant. You’re bringing it to that persuasive law strategy. I love it. That is just absolutely brilliant, Toby. Toby Unwin: It’s kind of a cool system, because once you’ve got these tools, you can apply it to lots of different things. For example, we got a political dataset and then we were able to figure out which lobbyists get which bills passed with which committees, agencies, and politicians. Mark S A Smith: Wow. Is that available as well? Toby Unwin: Yeah. It’s one I think we’ve coded up but we haven’t found a good partner to do it with, because it’s just not our area. There’s an amazing video on our website at premonition.ai if you look at Lobbying. We did a House of Cards themed trailer for it. This film was so good it was nominated for the Toronto Film Festival Short Films. Mark S A Smith: Why does that not surprise me, Toby? Toby Unwin: It’s the kind of thing that at the end you feel that you want to applaud. Mark S A Smith: What a great application of AI. Let’s disrupt through intelligent application of data. I want to dig just a little deeper. You obviously have some interesting systems for disruption. You’ve shared with me a little bit about how you’ve approached becoming a lawyer, an attorney, and how you hacked the system so that you could take that information in very rapidly. Tell me how you’ve done things such as breaking air speed records and learning five languages. You’re using some type of a system that’s highly disruptive. Toby Unwin: The languages one is, again, just breaking it down into the minimums of what you need to learn a language. When I say I speak five languages, I can have a basic conversation in five languages. I’m by no means fluent. If I get in a Uber cab in Miami, I can tell the guy where to go and have a basic conversation with him along the way. Like most languages, there’s only about 300 words that carry 80% of the load, and if you know those 300 words, you can pretty much have a conversation. When you’re getting started, if you don’t know the word for “cold” and you say it’s “not hot,” the person you’re speaking to can understand that. Mark S A Smith: Wow, what a great reversal of risk. Toby Unwin: Yeah, so there’s no pressure. Then he said, “Okay, there’s all these various words that end like this in English. All those words in English are exactly the same in Spanish but they end in ‘-amente’,” I believe. He said something like 300 of those words. Now you know 300 words in Spanish. That’s how that started. The rest of it continues like that, where he just takes a little very basic sentence and keeps expanding it and playing with it, and after a month of listening to that stuff you can have a decent conversation in Spanish. It’s breaking it down into the basic elements. Mark S A Smith: For you it’s about breaking things down to basic elements, finding things that you find interesting and that haven’t been done before, then just going out and creating the minimal set and then seeing how it works. Toby Unwin: Yeah. A lot of it is never having something being done before. Like, for example, if I find that someone else has done something, I usually don’t bother doing it. The only times we replicate someone else’s work at Premonition is if we feel we can do it 10 times better than they can. Otherwise, we just leave it alone. Mark S A Smith: I think that’s a really brilliant idea for creating disruption. If you can’t disrupt, don’t even bother. That is fantastic. How did you make your way from England to the United States? Toby Unwin: I’ve always loved America and Americans and their attitude. For example, if you have a nice car in England, people will scratch it, and if you have a nice car in America they’ll come up to you at the gas station and try and sell you something. It’s a completely different kind of atmosphere. I love America. Immigration is the sincerest form of flattery. Mark S A Smith: That would be true. Toby Unwin: People say immigrants are lazy. We’re not lazy. People with the get-up-and-go are the ones that immigrate. The lazy ones stay home. We didn’t come here to go on welfare. It’s not a coincidence that about half of the newly wealthy in America are immigrants, because they come here and they work really hard. Most of the immigrants that I know, they actually love America a lot more than Americans because they chose to be here. It’s not an accident of birth. Mark S A Smith: That’s right. I have to agree with you. My father said that immigrants have restless genes and they’re the people that make things happen. Mark S A Smith: … and I ain’t done yet. Mark S A Smith: Thank you. To have Toby say that what I’ve done is impressive is impressive. 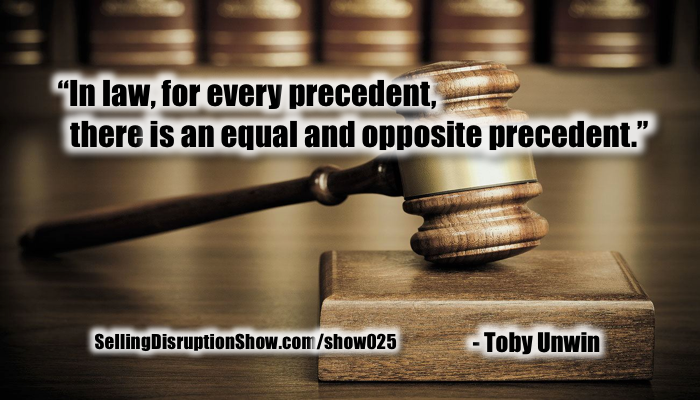 Because you, my friend, are one of the more impressive guests that I’ve had on the Selling Disruption Show, because you have disrupted in so many different, diverse areas. You’re definitely a polymath. What an absolute delight to have this conversation and to share it with my listener. What do you have as a parting idea as we wrap up the show today? Toby Unwin: There’s a couple of things. First off is learning to ignore people when they tell you you can’t do something. Mark S A Smith: I love it. That’s a disruptive idea right there. For example, when we were first building our crawlers and data downloaders, I took principles that I’d learned in flying helicopters to solve certain problems that we had in that and came up with ideas that were directly against what’s accepted to be good computer programming skills and methodology. We’d been trying the accepted stuff, and it’s not working. Let’s try this idea that I got from flying helicopters. That’s what wound up working. Mark S A Smith: Buckminster Fuller used to read multiple books simultaneously, he called it syntopic reading, for exactly that same idea of integrating disparate ideas across a wide range of topics to invent new things that hadn’t been connected before. Toby Unwin: Yeah. I do that for a little different reason. I usually read three books at the same time. I’ll read a book on business, a book on learning something, and a book that I’m reading for fun, and I’ll only read a chapter or 5% on the Kindle at a time. It means if you’re getting a book that you are learning a lot from, it forces you to take a pause every now and then assimilate the ideas. Mark S A Smith: I like it. Toby Unwin: Also, if you’re reading a book that’s really heavy and boring and difficult to read, you don’t give up on it because you only have to read a little bit at a time. Mark S A Smith: See, you just operate everything from systems, Toby. That’s all there is to it. You’re a systems guy, a systems thinker. Toby Unwin: Yeah. I have a lot of systems. People talk about having a goal sheet. I always thought that was a bit self-help, guru, and stupid. Why do I need a goal sheet? Because I know what my goals are. Then I read in this book called The Millionaire Next Door, they said that 80% of millionaires had a written, and written was underlined, goal sheet. I said, “Okay, I’m not doing anything for the next half-an-hour. I’ll write out a goal sheet, just to humor myself so I can say that I’ve done it.” It was very interesting, because I had one goal, which was to grow NetSearch, and another goal, which was to move to America. I realized that those were contradictory goals. In fact, they worked against each other. I couldn’t do both. It had to be one or the other, so I chose I was going to come to America. That was the decision I made, and having this goal sheet helped clarify it. Then I found that being more exact with your goals — I’ll put little pictures on it and I’ll write a date when I believe it can be accomplished and if there’s money involved how much it’s going to take to do that — it becomes almost like Santa Clause wish list, because after a while you find yourself ticking more and more of these things off. I have like a five-year goal list, because I found that life gets very random past five years. You are deluding yourself if you think you can plan past that time. I have a five-year goal list, and then I’ll break it down. I have a couple of Post-it notes. I have one for which month it is, and I’ll look and I’ll say, “Which of these goals can I move towards a little bit this month?” From there I have a second Post-it note of, “What smaller bits of this can I do this week?” I have a to-do list of which items need to be done and what type of item there is and which ones go first. You can often drown yourself in minutia, and the way to fix that is by just picking the one hard, difficult task and doing it first, even if it takes the whole day. If you have an unpleasant conversation with someone that you just have to have, you want to have that first. I don’t want to leave it, because otherwise it colors the whole day. You just get on with it and do it and then it’s out of the way. If you always are tackling the most difficult thing first, then you’re always doing the hard stuff that really moves you forward. Mark S A Smith: You’re absolutely right about that. I think that’s really wonderful advice. It runs counter to a lot of time management advice, which says, “Do the easy stuff so at least you’ve got some stuff ticked off your list.” But I think you’re right. The way that we disrupt is by doing the hard stuff, because if it wasn’t hard, it wouldn’t be disruptive. By identifying those goals that are tough, you really do make massive progress and you disrupt your environment. Thank you for sharing with us that goal system that you use. Toby Unwin: Yeah. I think you have a certain number of decisions that you can comfortably make in a day. Toby Unwin: Barack Obama said he only ever wears a gray or a navy suit. When you see Simon Cowell, he always has that tight black T-shirt on. Mark S A Smith: That’s right. “Bring me food.” One of my favorite things to do in any good restaurant. Let the chef decide. Bartender’s choice. Mark S A Smith: It’s a great way to disrupt how you view the world. Toby, this has been a fantastic conversation. I’ve really enjoyed getting to know you. How do people get ahold of you? How does our listener get ahold of you? Toby Unwin: It’s been fun. You can always go to premonition.ai and check out some of the things we’re doing there. I’m big on LinkedIn. I think that’s great. Toby Unwin on LinkedIn. That’s U-N-W-I-N. Always love connecting with people and talking with interesting people. Mark S A Smith: Indeed. Thank you so much for sharing your insights and your approach to disrupting the planet. Thanks so much, Toby. Toby Unwin: Thank you. I really appreciate it.